These days, every business should have a mobile website. In fact, it is somewhat of a necessity in order to survive in today’s digital world. Millions of people rely on their mobile device to do everything from ordering a pizza, browsing dating profiles, or betting on the big game. It makes sense for a business to have a mobile version of their website. It doesn’t matter how small the business is, because it will benefit from DudaMobile’s great free basic plan for mobile website development. You are in control of building your website. The platform allows you to perfectly customize your website so that it is exactly the way you want it to look. It takes less than 30 minutes to create a website that can be tested live immediately after conversion. First, before we get into the DudaMobile Review, here’s a little background about DudaMobile. Based in Palo Alto, California, they have been in the mobile website software business since 2009. They set out to improve the web for mobile devices. What makes DudaMobile so successful is their ability to easily convert a website from web to mobile, as well the scalability of their platform. 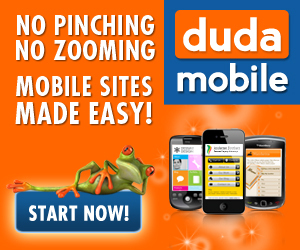 DudaMobile’s services have enabled almost 2 million consumer mobile sites to be created. Basic Plan: This DudaMobile Review should stress that this basic plan is FREE. There is no “catch.” All that is required is the display of ads on your website. That’s not a bad price to pay for a service that will get your business a lot more exposure. For free, you get a bandwidth of 500 MB, you can customize up to 10 pages, and Community Support. Mobile Site Analytics are also included. Premium Plan: This plan gives you all of the features that come with the FREE Basic plan, with the addition of unlimited bandwidth, your own mobile URL, Phone and Email Support, Click-to-Call, and Mobile Directions and Maps. Plus your mobile site will be free of ads. Hire a Pro Plan: The ultimate in mobile website design, this plan lets you sit back and let DudaMobile do it all for you. You get all of the features of the other plans, plus you get your mobile site completely built for you. Remember how your website used to look before web conversion? It was difficult to navigate the pages on a mobile device. It was also frustrating to have to scroll endlessly through pages to get them positioned just right so you could see them. Well, not anymore. Your business website can be effortlessly transformed into a highly attractive and readable site that is customized according to your exact preferences. Try DudaMobile’s basic plan for FREE by clicking HERE. There is simply no better platform out there that provides the same features at absolutely no charge. Take the advice from this DudaMobile Review and try them for business website today.